This is a list of my favorite wine bars in London. I have never lived in London or spent larger periods there. But I have stopped over in London many times during my career at the IMF (going from Washington DC to an Anglophone African country) and I have spent time there with two of my daughters who studied in London. A few weeks ago, I spent a couple of days in London, when my daughter Cornelia Tremann gratuated from the School of Oriental and African Studies with a PhD. This is a revised version of an earlier posting: Schiller’s Favorite Wine Bars in London, 2012, UK The list is a mixture of own experiences, recommendations by others and finds in the internet that I still have to check out. 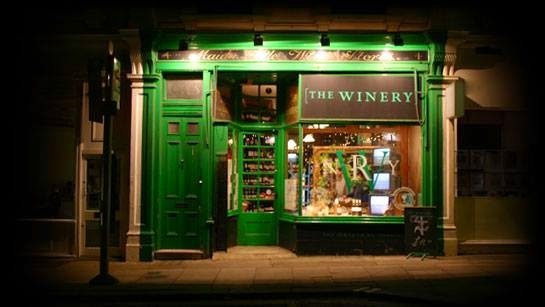 A very cool wine store, wine bar and wine bistro with an excellent and always changing choice of wines in the Covent Garden district. Excellent place also for an after-Opera dinner or drink. 10 Cases: Wine store - Once you've found your bottle you can either take it away with you or, if you can't wait, drink it in the shop for a £12 corkage fee. You will also find a selection of Charcuterie, Cheese, and a host of other little dishes under £10. Still & Sparkling water are on the house. The World of Fine Wine: It’s only a slight exaggeration to say that sommelier Xavier Rousset and his chef partner Agnar Sverrisson have helped revolutionize the wine bar concept in London with their 28-50 Wine Workshop & Kitchen. The idea—now applied to three venues across the city after the success of the original site in Fetter Lane—is simple: a concise list of 30 wines, each served by the glass, carafe, or bottle, and matched with an affordable menu of simple, well-cooked modern bistro dishes. What makes it work so well is the skill on show: both in the quality of the cooking, and the imagination put into the limited selection of wine choices. The wine list is a microcosm of the current natural-minded zeitgeist, with the accent on drinkability rather than showy fruit and extreme concentration, on small producers and backwoods appellations, rather than the traditional big classic names (although there’s a tempting handful of mature classic vintages such as Vieux Château Certan Pomerol 1983). Jancis Robinson: Another very welcome addition to the scene are the wine-focused 28-50 restaurants, which describe themselves as 'wine workshops and kitchens': one just off Fleet Street, a second branch in Marylebone and a third just off Regent Street. Jancis Robinson: Under the rumbling railway arches of London Bridge you'll find 40 Maltby Street - more wine-bar-serving-food than restaurant, the small plates cooked to order in their postage-stamp kitchen are delicious and the wine list is full of unusual gems featuring a lot of natural and biodynamic producers. You can take a bottle home at retail price, and the mark-ups are transparently low. A famous wine store worth to take a look at. Jancis Robinson: But step on to the bare boards of the original wine shop and you will get something of the flavour of an 18th-century London merchant. Berry Bros still have the weighing scales and records of the weights of Regency dandies and worthies, and the well-suited young men may now use computers but they (the computers rather than the young men) are cunningly inset into old-fashioned high wooden desks. Have a snoop around and ask if you can see their recently restored cellars on at least two floors below in which many wine events are held. The London version of Bar Boulud (in New York City), with a fine, mainly French wine list and always something superior available by the glass. This is a hidden gem in the center of Covent Garden. It is difficult to find, as it is in the basement and there is only a small door at the street level. But it has a soul. I felt very comfortable there. They have a wide selection of new and old world wines, which includes many excellent wines. Large selection of Bordeaux wines, but also other French regions. The wine bar was established 30 years ago by Don Hewitson from New Zealand, who still owns and runs it. There are many tables were you can eat or just drink a glass of wine and several of these tables are in unusual locations such as under the stairs or in a corner niche. Remember the wine bar is in cellar. A hip place divided into a restaurant (upstairs) and a wine tapas bar (downstairs). Plus, there are a few tables on the sidewalk of Marylebone High Street. The Providores and Tapa Room is run by New Zealand’s star chef Peter Gordon and his business partner Michael McGrath. The wine list is large and the wines are exclusively from New Zealand. Downstairs is the buzzing Tapa Room, with a large communal table. Breakfast is very popular here, in addition to the selection of excellent tapas. Upstairs is the serene Providores, a classic dining room, where you order fixed-price menus. I did not eat upstairs, but I understand it is very, very good. A long classic wood high counter table stands in the center of the Tapa Room. So, lots of chatting with people you don't know. Einstein-esque orange light bulbs hang from the ceiling. And an enormous Rarotongan Tapa, or ceremonial cloth from the South Seas, is covering one wall, hence Tapa Room. Tapa cloth can be found throughout the Pacific and is used either as a decorative piece, as a ceremonial floor covering at feasts, or in some cases as fabric for clothing. The wine list is almost entirely from New Zealand and has well chosen growers. If you do not like New World wines, do not go there. But if you are open to the wonders of the New World, your will find them there, right in the center of London. If you do not like wines from New Zealand, stay away. But if you like them, this is the place to go. I have never seen such a broad and deep selection of excellent wines from New Zealand outside of New Zealand. Naturally, the focus is on Pinot Noir and Sauvignon Blanc. Gordon’s Wine Bar is quite a place. It is London's oldest wine bar. Full of character, it’s something of an institution in London . It has been established in its present form in 1890, when it was founded by Arthur Gordon. Time seems to have stood still at Gordon’s. It drew literary figures like Rudyard Kipling, who wrote The Light That Failed in the room above the bar and numerous celebrities including Lord (Lawrence) Olivier and Vivien Leigh. Gordon’s is buried deep and dark beneath the streets with only a small doorway and a subtle sign indicating its presence. As you enter Gordon’s, you find yourself in a room with old wooden walls covered in historical newspaper cuttings and memorabilia faded with age. Make your way to the cellar to get a candlelit table. You’ll probably have to wait a while for a table, but there’s no great hardship in propping yourself up in a corner and waiting for one to become available or, alternatively, asking to share the corner of someone else’s. If the sun is out you can also sit outside in the Watergate walk and enjoy watching the world go by. If you look for outstanding wines, do not go there. Gordon’s wine list is not bad, but does not impress a wine expert. Gordon’s wine list includes a wide-ranging collection from the New and Old World, at reasonable prices. It is the stunning atmosphere of Gordon’s that makes these average wines so special. I liked the sturdy tumblers of port or sherry served straight from casks behind the bar. Equally, the food is simple stuff; but it comes in generous portions ranging from home made pies to mature cheeses. Basic, good food. Jancis Robinson: Hedonism is by far the most luxurious, central London wine store. Owned by a Russian tax exile, it is an extraordinary treasure trove of bottles of interest to anyone seriously interested in wine with, for instance, Yquems and Sine Qua Nons coming out of its ears. There are many tiptop wines on taste by the glass. Many a wine lover could spend hours in here. The Kensington Wine Rooms: Since we opened in April 2009, we have acquired a reputation as one of London's best wine bars, and as a focal point of the local dining scene in London's Notting Hill. In 2010, we were named Newcomer of the Year by Decanter magazine. The bar area is a mixture of high seating and banquettes seating upwards of 40 people, with plenty more space to stand. It's a friendly and interactive environment to sample some top wines along with tapas-style bar snacks. Jancis Robinson: Our son Will Lander re-opened the listed Victorian working men's dining room that is The Quality Chop House in Farringdon Road, specialising in really interesting wine at good prices and British, produce-driven food in a restaurant and next door wine bar. For obvious reasons, I strongly recommend it and it has garnered some rave reviews from highly respected third parties. Just Opened London: All about experiencing wine (rather than just glugging it as we are occasionally prone to), Sager + Wilde offers premium and rare wines by the glass at retail prices. And, with over 30 different wines on offer, that is a lot of sampling to do. Sitting alongside this well researched and incredible wine list is a simple food menu of cured meats, cheeses, homemade pickles, tartines and grilled cheese sandwiches. Taking over an old pub, Sager + Wilde has character in abundance with glorious high windows allowing the sun to stream in, stripped back Edwardian parquet flooring, exposed Victorian brickwork as well as a steel passage lights from a Japanese supertanker, 1920′s German station lights and large porcelain and glass ceiling lights from 1950′s British factories. Seating up to 60 people, this is a wine bar like no other and one, we reckon, will be a London favourite in a matter of weeks. Terroirs is a wine bar and restaurant situated in the heart of the London West End, a stone’s throw from Trafalgar Square and adjacent to the Charing Cross station. It seats 45 covers with a further 12 seats at the zinc top bar (which are non bookable). In terms of the wine selection, it resembles very much the San Francisco Terroir. But while Terroirs London also focuses on natural wine, it defines natural wine in a broader sense than the Terroir San Francisco, wines that I would call “green wines”, wines made with an ecological concept in mind. There are lots of certified organic and biodynamic wines on the list. The focus is on France and Italy. I did not see any New World wines. Many of the French growers are certified organic and biodynamic. Several of the Italian growers belong to Vin Veri (Real Wines), a movement of like-minded natural winemakers. About 25 wines are under £20 and 80 in total under £30. Charcuterie is a feature of Terroirs. The selection changes but usually offers a terrine, a rustic jambon persillé, some French saucisse, lardo di Colonnata and ham. A selection of seasonal cheeses is available. The cheeses can be ordered individually or as part of a selection. There are also quite a number of full-sized dishes - pot-roasted quail with pancetta and gremolata, for example, or salt cod with soft-boiled eggs. The Terroir between Trafalgar Square and Charing Cross has a number of offshoots: Brawn in Columbia Road, East London, Soif in South London, Toast in East Dulwich and The Green Man and French Horn in St Martin's Lane. Terroirs and its sister wine bars are closely associated with wine importers Caves de Pyrène and the natural wine movement. The Searcys St. Pancras Champagne Bar is situated just next to the tracks were the Eurostar arrives, below the magnificent Barlow Shed, allowing a full appreciation of the amazing architecture of the historic Victorian St. Pancras Station. It is a truly unique and stunning venue. The set up is very nice and comfortable with a range of different seating options. It is a formidable place to celebrate the arrival in London or wait for the departure of the train for Paris or Brussels. The St. Pancras Champagne Bar has an outstanding and very wide selection of NV Champagnes as well as older vintage Champagnes. If you are in a group, you can go for a larger size: The bar carries Magnums, Jeroboams, Methuselahs (= 8 bottles) and even super large sizes. Dry German wines are the speciality of owner David Motion, who I bumped into at the 2nd International Riesling Symposium in the Rheingau (2014). Timeout London: We’re big fans of this small wine bar and shop, and we’re not alone. The no-bookings policy in the evening means it’s first come, first served, and such is Vinoteca’s reputation for interesting wine and food at very acceptable prices, there’s always a queue. Also recommended by Jancis Robinson: Vinoteca near Smithfield market, in Seymour Place just north of Marble Arch, and now also in Beak Street, Soho, are establishments that are effectively wine bars with very superior food. Not really a wine bar, but my favorite place for having oysters and a glass of wine in London. On fashionably foodie Borough Market, it is a spit-and-sawdust kind of place with customers huddled around barrels outside or crammed shoulder-to-shoulder in the brick-walled bar. Shucking and guzzling in the business of the day and everyone has a great time: have your British oysters with pints of Guinness, or go for Champagne. The day's selection of oysters is written on the blackboard. Other exciting sea food items include wild mussels, razor clams, langoustines, pints of prawns, winkles and whelks. The owners just opened another place in Soho, to which I have not yet been. The restaurant comprises three different floors. Downstairs combines the Wright Brothers Oyster House feel with high table communal seating and an open-plan kitchen. Upstairs is a more traditional restaurant experience. On the ground floor the raw bar spills out onto the courtyard of Kingly Court, just off bustling Carnaby Street. Willi Igel wieso fehlt 29-50? Les 110 de Taillevent offers 110 wines by the glass alongside classic French cuisine. Noble Rot Wine Bar delivers eclectic and excellent food and wine. Enjoy a slice of real London at Soho stalwart Andrew Edmunds; its wine list has some incredible values. Order from the old-fashioned menu at Sweetings, an oyster house unchanged since 1889. Around the city, there are flavors to be savored from all over the world, such as Thai at Som Saa, Indian at Dishoom, Basque at Sagardi or Turkish at Yosma.